A 14 year-old boy who is unable to leave his house due to multiple health issues has been able to meet some of his favourite football players (and watch a game) by controlling a robot that was carried out onto the pitch. Jack McLinden, a fan of Everton (in England’s Premier League), lives just two miles away from the team’s home ground of Goodison Park. But he’s never been able to attend a game, because his need for a constant oxygen supply prevents him from travelling. As the BBC reports, though, a Norwegian company called No Isolation was able to help. They’ve created a robot called AV1, which was primarily designed so that sick children could still receive a regular school education by having the robot present in class, beaming everything it could see and hear back to the kid at home while also allowing kids to interact with classmates using lights and a microphone. Working with British charity WellChild, an AV1 was present at Everton’s game against Newcastle earlier today. 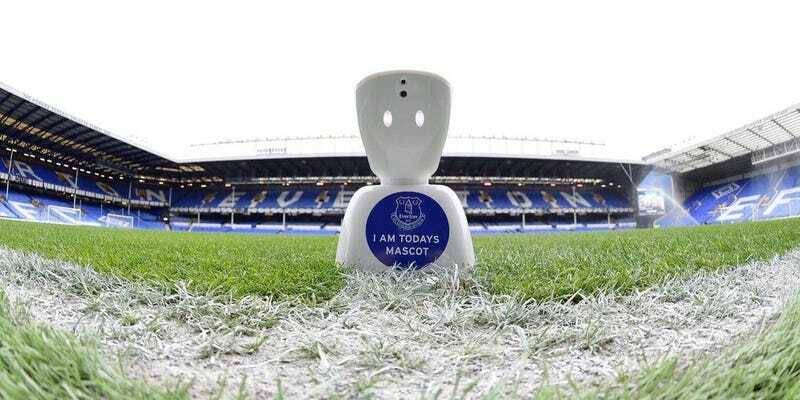 With basic controls operated by Jack at home, the robot was carried out onto the field at the beginning of the game to soak up the atmosphere, and Jack was also able to meet and speak with some of his Everton heroes. He even got to attend the post-match press conference, sitting alongside manager Sam Allardyce. Everton won the game 1-0.